Formed in 1967, this British-American rock legend has sold more than 100 million albums worldwide, making them one of the world’s best-selling bands. Despite their success, the road hasn’t always been easy. 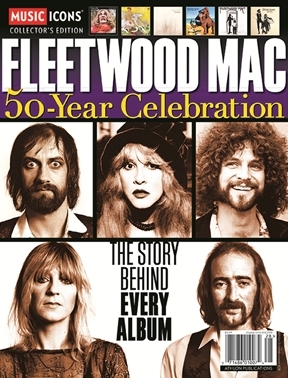 In this beautiful, editorially rich special written by respected music journalist Chris Gill, we follow the band’s evolution from gritty blues band to glamorous pop music icons, fronted by the bewitching Stevie Nicks and guitar hero Lindsey Buckingham. The stories behind every album come to life, including Rumours, which has sold over 40 million copies, making it the eighth-highest-selling album of all time. This collector’s item will arrive on newsstands just in time as fans flock to the band’s farewell tour, making it an indispensable keepsake for anyone who loves music and rock & roll history.